Need some accessories to dress up your wardrobe? Look no further than the Joolwe.com Sterling Silver Jewelry Store! Joolwe.com is a new online jewelry store that offers customers a myriad of jewelry in a wide array of metals and gemstones and are totally affordable. They believe that online jewelry shopping should be a fun experience, and their approach to this is offering customers fabulous jewelry at outstanding prices, while providing excellent customer care. Joolwe.com offers free shipping on all orders, a best value guarantee, an easy returns/exchange policy and a biweekly free jewelry giveaway. Subscribe to their newsletter to be eligible to win their great giveaways and check out their Jewelry News & Fashion blog! Lipgloss Break is partnering with Joolwe.com to give away this stylish gold Cheetah ring. 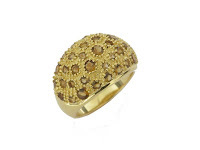 This Gold over Sterling Silver Ring will make you feel as wild as it looks! This ring is available in size 6, 7, or 8. How to Enter: I want to know what your favorite accessory is! Leave me a comment and tell me about your all time favorite accessory and your favorite piece on Joolwe.com. The contest is open to both US & Canada residents. I will randomly select the winner on May 10th (Mother's Day). You can get an extra entry if you follow my blog (make sure to include it as an extra comment). I'm not huge on accessories but I do wear earrings. My fave accessory of all time is this pair of pearl stud earrings that I sort of "hogged" from my mom and I wear it everyday! My fave piece from Joolwe.com is the 10k Gold and 0.75 ctw Diamond Wide Band Hoop Earrings. 18k Gold over Sterling Silver Multi-Gemstone 3-Row Bracelet. My favorite accessory is necklaces -- long, short, layered or individually! My favorite is a strand of pearls that were my grandmothers; I only wear them on special occasions, but it's still my favorite accessory! I love bracelets and anklets. Thanks for the chance. My favorite accessories is necklaces with pendants. Really love them. My favorite piece of jewelry from Joolwe is the 18k Gold Over Sterling Silver and Smoky Quartz Teardrop-Shaped Necklace. My favorite accessory is my pair of diamonds hoops. My favorite item from the joolwe website is the 10K White Gold and 2.07 ctw Pink Sapphire Butterfly Pendant...it's simply gorgeous and would look awesome with my hoops! My favorite accessory is my stud earrings, which I wear ever day. A good pair of studs can be worn with everything! My favorite accessory is a scarf. Wear them all the time. My favorite piece from Joolwe is the Sterling Silver Smokey Quartz and Peridot Pendant. I love the 18k Gold Over Sterling Silver Multigemstone Openwork Ring! My all time favourite accessory for myself, has been my hair lol For every journey I went through I had different hair! I've had a shaved head a few times and I really do consider my hair to be an accessory! My all-time favorite accessory is a sterling silver heart necklace that my mom gave me. My favorite from Joolwe.com is the 10K Yellow Gold Diamond Accented Floral Design Ring. My fav. accessory is my wedding ring. Love to wear it! My favorite accessory is the watch my husband gave me. I actually feel lost when I'm not wearing it. My favorite piece of jewelry on Joolwe is the Elle Sterling Silver Green Quartz Teardrop Earrings. I love the color! My favourite accessories are scarves and pashminas...they liven up everything I wear!! My favorite and most treasured jewellry is the diamond necklace that was a Christmas gift from my husband. Forgot to add, my favourite items on Joolwe.com are the Elle Sterling Silver Black Agate Earrings!! My favorite accessory is a ruby necklace passed down to me from my grandmother. One of my favorites off the site was the Elle Smoky Quartz Necklace. I follow your blog via feed. My favorite accessory is my teddy bear charm necklace. I collect teddy bears so I love that necklace. My favorite piece from Joolwe is the 18k Gold Over Sterling Silver Multigemstone Openwork Ring. That is a lovely ring that would go great with my teddy bear necklace! my fave accessory is a necklace. My fav. accesory is mywedding ring. My favorite accessory is my apple glass necklace, i've never seen anything like it and it's so vintage-y. My fave item in Joolwe is the 18k Gold Over Sterling Silver Textured Wave Cuff Bracelet. My favorite accessory is a nice handbag. My favorite from Joolwe is 10k Yellow Gold 1/5cttw Hoop Earrings. Thanks for the chance. I would love to win this in a size 6. My favorite accessory is my Pedre watch. Thanks for the chance!! OMG, their White Gold, Tanzanite and Diamond Butterfly Ring is so beautiful! All of their stuff is very pretty but this really stands out! My favorite accessory is a yellow gold ring with 10 small diamonds in a row. My husband gave it to me on our 6th anniversary when I was pregnant with our first child. I found lots of gorgeous jewelry that I loved at Joolwe. I'm realy into earrrings at the moment so my favorite pieces are the 10k Yellow Gold and 2.46 ctw Blue Topaz Butterfly Dangle Earrings and the 10k Yellow Gold and 0.10 ctw Diamond Butterfly Earrings. I love butterflies! Thank you for the opportunity. On Joolwe.com, my favorite accessory is the 10k White Gold and 0.33 ctw Diamond Geometric Earrings. My favorite accessory that I own is a pair of extra large 18K gold hoops. My favorite accessory if the white gold and diamond antique ring my parents bought me for my birthday last yr. It is very unique looking and just my style so I love it. My fav item on Joolwe is the Sterling Silver Aqua Colored Rhinestone Oval Necklace, for sure. Favorite accesory: My heart pendant that my friend gave to me. I love it so much. Favorite item from Joolwe: Gotta be the Sterling Silver and 0.25 ctw Diamond Cascading Hearts Necklace! Love it! My favourite accessory is the promise ring that my father gave my mother 60 years ago. Love the 18k Gold Over Sterling Silver and 1.75 ctw Amethyst Indian Goddess Necklace! My favourite accessory is my wedding ring. I like the white gold, blue topaz ring. I don't have a favorite accessory. I like the Indian Goddess necklace. My favorite accessory is sterling silver hoop earrings! They are a must! I love post earrings. I love the Butterfly post earrings on Joolwe.com. Very pretty. My favorite accessory are my charm bracelets. I like the Sterling Silver and 0.25ctw Diamond Starry Nights Drop Necklace on Joolwe. My favorite accessory are my large dangly silver swirl earrings. I subscribe and follow your blog. I love bracelets, but they have to be simple & functional (nothing I have to worry about coming undone). The toggle fasteners seem to be a problem for me, as I have lost 3 or 4 of my favorites. I also have a pair of small diamond studs that I've worn for 25years, only removing them for cleaning. I love the double circle bracelet on the Joolwe site, but there are lots of other things I'd love to have. My favorite is a necklace my mom gave me. I like the Sterling Silver and 0.25 ctw Diamond Double-Row Circle Bracelet. Its so pretty. my favorite accessory are my diamond earings! =) i love 18k Gold Over Sterling Silver and Smoky Quartz Teardrop-Shaped Necklace!! i love this large turqoise necklace that i have and i really love their 10K Yellow Gold Diamond Accented Floral Design Ring. My favorite accessories are my many rings. I feel that i am so unattractive that most pretty things are just wasted on me. But I do have very nice hands, so I like to accent them with beautiful and interesting rings. My very favorite, of course, is my mother's ring which contains the birthstones of all four of my children, two of whom are now deceased, my husband and myself. I wear it in the place of my wedding rings as it represents all my loves. After all, our children are still ours forever, right? My favorite accessory is my gold and silver dragonfly pendant that my fiance gave me. I always get so many compliments on it. I'm a necklace & bracelet person. rings are fine but I keep scratching them. My favorite accessory is my silver heart locket necklace with a picture of my niece in it, and my favorite piece from Joolwe is the Sterling Silver and Cubic Zirconia Puffed Heart Toggle Necklace. My favorite accessory is a silver and green bangle bracelet - I'm not sure why, but I love it and wear it with almost anything that goes with it! My favorite accessory is my wallet. My favorite accessory is my handbag. I love using handbags to compliment my outfits. My favorite accessory is my designer handbags. I can't leave home without one. My favorite peice at Joolwe is the Sterling Silver and Cubic Zirconia Puffed Heart Toggle Necklace. Thanks for the great giveaway. This ring is gorgeous. I like the Sterling Silver and 0.25 ctw Diamond Starry Nights Drop Necklace. My favorite accessory to an outfit is the jewelry. I lvoe to wear neckalces and bracelets to accent my outfit. My fave accessory is the one I never take off and that is my snazzy medical alert bracelet. I have rings, earrings, watches and bracelets that I wear occasionally, but my medical alert bracelet is something that could literally save my life. My favorite accessory is my Wedding ring - of course! My favorite accessory is my grandmother's gold bracelet. It is beautiful and has been worn by three generations of women in my family, so it is full of memories, too. My favorite piece on Joolwe is the Athena Citrine Pendant With Sterling Silver Cable Necklace. Totally gorgeous! My sister loves the 14k Gold and 0.25 ctw Diamond Cross Pendant. Please accept my entry. Thank you. Love the Sterling Silver and 0.25 ctw Diamond Starry Nights Drop Necklace. My favorite is my Tiffany Elsa Perretti 'bean'. My favorite is the Elle Smoky Quartz Ring. Thanks fo rthe beautiful giveaway. My favorite accessory is my wedding ring. I would love to wear this ring also. My all-time favorite accessory is a vintage Gucci bag my mom gave me. Day to day I love to throw on a big chunky RING to make me feel accessorized. I always wear My very FAV accessory...a pair of diamond earrings my DH gave me! Very special. They are wonderful so they HAVE to be my FAV overall. My FAV item at JoolWe.com is '14K White Gold Heart Shaped Amethyst and Diamond Accent Ring'.....STUNNING! I am a follower....and I added your feed to my google home page. i dont' have a favorite accessory now but i do want to love my engagement ring.My favorite piece of jewelry on Joolwe is the Elle Sterling Silver Green Quartz Teardrop Earrings. i forgot to include my fave piece on joolwe.com...hard to pick just one but I really like the Sterling Silver Openwork Ring. Oh! Everything on the site looks so wonderful,but my favorite is the 10k White Gold, Onyx and 0.10 ctw Diamond Dragonfly Ring. I love how dramatic looking it is. My favorite item from Joolwe are the ELLE Sterling Silver Green Quartz Teardrop Earrings, they are just gorgeous!! I fell in love with them the moment I saw them, so pretty and feminine! My favorite accessory is a gold locket that my grandmother gave me. I wear it almost everyday and she in turn had worn in everyday. The locket is relatively plain, it is round and has a gold filigree design engraved on it but it was the first nice piece of jewelry my grandfather had purchased for her after they were married so it has a lot of sentimental meaning and history behind it. One day I will present it to my daughter and share many stories with her about my grandparents. It will become a family heirloom I hope! BTW ~ I love this ring, it has that slight bling factor that I love to wear!! Thank you for the opportunity to enter. My favorite accessory is a basic pearl necklace I got when I graduated from high school many years ago. My favorite Joolwe piece is the 10k White Gold and .25 ctw Diamond Circular Drop Earring. I cannot leave the house without my earrings. It is a MUST. I must admit that I'm a jewelry junkie and they have so many nice pieces. I like their Sterling Silver Cascading Circle Drop Earrings the most. Christina - xristya@rock.com - My favorite (nowadays, it changes!) accessory is a Marcosite and Garnet Heart - the heart is encased in a marcosite and silver setting - it looks very old-fashioned and always receives compliments! Christina - xristya@rock.com - Sorry I forgot to tell my favorite Joolwe jewelry - it's the Smoky Quartz Necklace - and my favorite accessory is in the post right above! Thanks for the wonderful giveaway and the chance to win! I love all kinds of accessories including earrings--ELLE Sterling Silver Smoky Quartz Drop Earrings. Thanks for the giveaway. My favorite accessory is a simple silver band.My favorite item from Joolwe is the 18k Gold Over Sterling Silver and Turquoise Ring. I can't live without my gold hoop earrings and I love the Joolwe Sterling Silver and 0.75 ctw Open Circle Necklace! My all time favorite accessory is my blue topaz ring. It makes me feel great when I wear it! I love the 18k Gold Over Sterling Silver Textured Circle Charm Bracelet from Joolwe! Beautiful. my favorite is 18k Gold Over Sterling Silver Multigemstone Openwork Ring. My favorite accessory is earrings~I have so many pairs and yet I buy more..
My favorite~Sterling Silver and .70 ctw Brazilian Amethyst Dangle Earrings!! I really love big, flashy rings. I had a great aunt who would wear multiple huge rings on each finger, I loved it :). I saw this ring, the 10k White Gold, Onyx and 0.10 ctw Diamond Dragonfly Ring, on the front page and love it! I love earrings, mostly medium to large sized. My favorite piece is the Sterling Silver, Cubic Zirconia and Pearl Fancy Drop Earrings from Joolwe. My favorite accessory is the leopard skin jasper bracelet I made to go with my leopard print dress. I love the Sterling Silver and Multigemstone Crown Jewels Brooch. My favorite accessory is a bracelet. I also like bracelet style watches. Thanks so much for introducing me to the Joolwe website. They have some very beautiful pieces. My favorite is the Sterling Silver and Cubic Zirconia Puffed Heart Open-Link Toggle Bracelet. I have two favorites that I've cherished for many many years. One is a necklace/pendant that is actually a VERY ancient Chinese KEY that my Mother brought back for me from her trip to China. And the other is actually a ring that looks very similar design-wise to the Cheetah Ring (or like the Joolwe ring :"I have two favorites that I've cherished for many many years. One is a necklace/pendant that is actually a VERY ancient Chinese KEY that my Mother brought back for me from her trip to China. And the other is actually a ring that looks very similar design-wise to the Cheetah Ring only more like the Joolwe Gold over silver ring with multi-colored gemstones, which Joolwe sells for $29 - while I got my version for $300 in Florence, Italy years ago. Still I adore it. The Cheetah Ring would join my favorites because the neutral/natural/animal color scheme would go wonderfully with so much of my wardrobe. Love it! Oooh, I love the Cheetah ring, but I also spotted this-18k Gold Over Sterling Silver and 1.75 ctw Amethyst Indian Goddess Necklace- and feel in love! I am a total earring junkie and have hundreds of pairs! The quartz teardrop earrings on this site are wonderful! All time favorite accessory would have to be my huge starburst brooch. Sterling Silver Graduated Teardrop Necklace. I love the Sterling Silver and Ruby Stackable Floral Ring! My all time favorite accessory are my (fake) diamond stud earrings!! I love them fro their versatility! My favorite accessory is the engagement ring that was delivered to me after my fiance died of bile duct cancer. It means the world to me and is the symbol of immortal love. My favorite accessory is my engagement ring. It is an antique piece that my husband chose. My favorite piece from Joolwe.com is the Ruby and Diamond Garden ring. Stunning! My favorite accessorie in a golden cross necklace with a blue topaz stone. My second favorite are my cz stud earrings. I follow on bloger & would love the size 8 if chossen ! my fav accessory is a gold Ankh that i never take off..i worn it for so many years, and it still is very important to me. My favorite is my diamond drop necklace my husband got for me. I like the Sterling Silver and 0.25 ctw Diamond Double-Row Circle Bracelet. I love the 10K White Gold, 0.84 ctw Black and White Diamond Bat Pendant! My favorite accessories are my small sterling hoop earrings; they go with everything! My favorite at Joowe is 18k Gold Over Sterling Silver and Smoky Quartz Teardrop-Shaped Necklace. News Break - Stila Cosmetics Sold! Lipgloss Break - Do you know the Lipstick Queen? Total Beauty Break - Did Your City Make the Cut? Quiz Break - How Sun Smart Are You?